Rajasthan Budget 2013-14 Highlights: Rajasthan Budget 2013-2014 is presented today, 6th March 2013 by the Chief Minister of Rajasthan Hon. Ashok Gehlot in the Assembly of Rajasthan. He will present 4th Financial budget of Rajasthan in row. 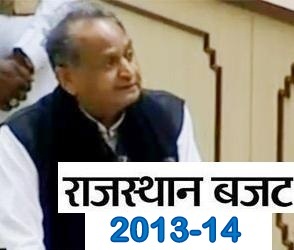 This is last Budget by Rajasthan CM Mr. Ashok Gehlot before Assembly Election in December 2013 or January 2014. For Live updates Bookmarks or Follow us on Facebook, Google+ or Twitter. * Rajasthan CM Ashok Gehlot reaches Vidhan sabha bhawan. * Ghanshyam Tiwadi admitted in hospital after health problem. * Ashok gehlot begins his Last budget before election this year. * Ashok gehlot asked Opposition party to maintain decorum of Budget session and agree for any inquiry. * Congress allege BJP is afraid of Budget 2013-14. * Leader of opposition can do inquiry, i am ready for any inquiry - Ashok Gehlot with 100% confidence. * Rajasthan has finally get refinery, at-least cheers - Ashok gehlot. * So Now finally begins Budget 2013-14 speech after BJP agree with assurance from speaker and CM Gehlot on inquiry. * 650 Crore for Roads in Rural Areas for New roads, renovation. * 9500 Crore for 6000 KM roads in state. * New Rajasthan state Wind energy policy 2012 will promote wind energy. * We will promote Wind Energy, Solar energy in state and new projects are approved. * Rajasthan Budget 2013-14 YOJNA = Rs. 40149 Crore. * No hike in Electricity bills for BPL, Farmers. * Debt restructuring of State Electricity Companies, 400 Sub-station of 33 KV. * Roof Top power Generation scheme of Rs. 100 Crore in Jodhpur. * Water to Jaisamand dam of Alwar from Rivers. * Road widening of Baneshwar dham. * 20000 New Hand pump, Drinking water to 3000 Villages. * 60 Crore for better usage of Chambal water in state. * 404 Crore to Bikaner villages for various schemes. * 621 Crore to Jodhpur disctricts. * Beawar, Nasirabad and other villages will get Bisalpur dam water for drinking. * Cancer and Kidney treatment aid of 1 Lakh for below 1 Lakh income, and Free to BPL families, scheme extened to private hospitals too. * Free Health Check-up in Rajasthan from 15th August 2013. * Medical staff 20000+, Doctors 8000 post, 64 Dentist post. * 200 Janani Express, 100 more 108 ambulance with New Post of drivers. * 2000 Post for Free Medical check-up scheme of Rajasthan. * 1000 post in General Health Centers. * Rs. 300 Crore for Devnarayana Scheme. * 1500 Para computer teachers in Madarasa Schools. * Promotion to Inter-caste marriages in ST/STs. Rs. 5 Lak on Inter-caste marriage. * Scholarships for SC,ST, SBC, OBC Students. * Two free Uniform to Aanganwadi childrens. * 125 Days work in MGNREGA / NREGA in Budget 2013-14. * More medicines in Mukhyamantri Nishulk pashu Yojana, Mobile Hospital on block level. * Rs 1 / Kg. wheat in for BPL families instead of Rs. 2, Rs. 5/Kg. for APL families instead of Rs.8. * Technical training to youth, 25 new ITI Colleges. * 1000 Primary school to be upgraded. * 20000 Third grade teachers Jobs in Rajasthan. * 1000 Urdu teachers, 1000 Urdu Lecturers in Rajasthan. * 10000 Post of 2nd Grade Teachers in Rajasthan. * Tablets to Class 8th Topper, Gulabchand Kataria opposes, how you decide topper when we are going for Grading systems in state. * 15 New Colleges in Rajasthan. * Library on Panchayat Samiti headquarters. * Sports school in Jaipur. * IIT in Kota soon. * 5 Crore for Scince city in Jodhpur, Rs. 5 Lakh price to one scientist each year. * Special emphasis on woman colleges. * 1020 Driver, 1000 Conductors Jobs in Rajasthan Roadways. * Ajmer Vikas Pradhikaran / Ajmer Development Authority (ADA) annouced. * Rajasthan Habitet center annouced in Budget 2013-14. * Pali, Barmer, chittorgarh, sikar to gets Nagar Sudhar Nyas in Budget 2013-14. * Udaipur Nagar Nigam annouced in Budget 2013-14. * 3500 Technical, Administrative post in Rajasthan. * Senior Citizen Tirth Yatra scheme launched for 25000, with 100% expenditure paid by Govt. of Rajasthan. * 12000 Police constable Jobs in 2013 in Rajasthan. * 15000 New homes in Rajasthan. * Police training institute in Bharatpur. * 1 Lakh aid for Kailash-Mansarovar yatra. * 600 Post in Rajasthan Jails. * 8 Up-Tehsil will be upgraded to Tehsil. * 10 Crore to Bar-Counsil. * 641 Post of Patwaris in Rajasthan. * Airport in Kishangarh, Ajmer, free land will be provided to Airport Authority of India. * Laptop for recognized Reporters. * 50000+ Employees will get benefits of new promotion policies of Rajasthan Govt. * IT Center in Dholpur. * Tax hike to 65% from 50% on tobacco products. * E-Payment facility in tax. * 6th Pay commission beneftis to Rajasthan state govt. employees from 1st July 2013.